Erin Schwab was born in Morinville, Alberta Canada. She holds a BFA from Alberta College of Art and Design and graduated with distinction in 2006 from University of Alberta’s MFA program in Drawing where she focused her research on filtering the language of traditional botanical illustration and ceramics through the dialogue of contemporary drawing. 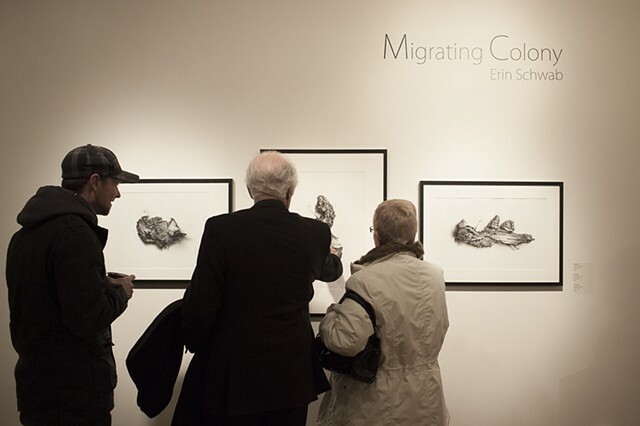 Recent Exhibitions include Migrating Colony: Flood at Line Gallery in 2014 and Future Station: 2015 Biennial of Contemporary Art at The Art Gallery of Alberta. Schwab is currently teaches in the Art and Design program at Keyano College in Fort McMurray where she has been dedicated in the development of arts and culture in the region through her participation in the development of the Arts Council Wood Buffalo and of the Arts Advisory Board for the Alberta Legislative Assembly.